Commonwealth Worldwide has launched our state-of-the-art mobile application, designed specifically for the convenience of our passengers. "Call or Text Your Chauffeur" Function - connect directly to your driver with the touch of a button. A photo of the chauffeur (when available) helps you recognize him or her, providing added peace of mind. You can also call our office from the same screen. Trip List - view all of the details of the trip, including current status, current itinerary and even change active trips in advance. Make a Reservation - book a trip anywhere around the world directly through the mobile app. Personalized Settings - set alerts to be notified of any or all status updates, via email, text or phone - however you prefer! 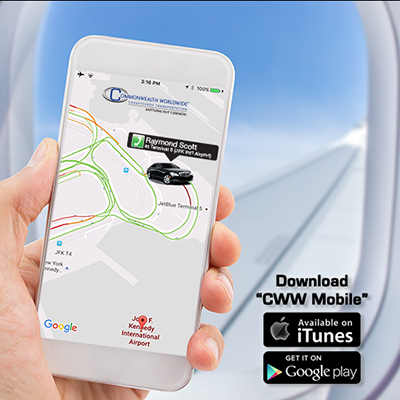 To download our app, click below or search Google Play or the App Store for "CWW Mobile" - download it and start exploring! If you already have a Username and Password with us, you can Login with that information. If you're not sure, just call us and we'll be happy to help!